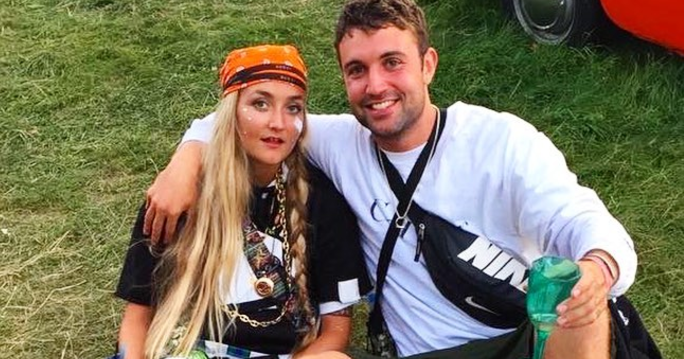 Louella Michie tragically died at Bestival on Monday, her 25th birthday. The cause of her death is still unknown, but her close friends and family are adamant that her death was accidental. People could easily have a false perception of Louella's background and upbringing, as her father was John Michie, a well-known actor. But just because she's got a famous dad, that doesn't mean she was privileged, middle class, or posh. In reality, Louella was just as ordinary as you, me, or any other person. My first encounter with Louella was at an after party in Hackney Wick, about three years ago. I was approached by the beautiful young blonde girl who introduced herself to me and my friend. After this, I saw Louella around and about very often, mostly in the Hoxton Art Gallery, which was managed by a close mutual friend. She was one of the kindest, most generous, loving, and spectacular human beings I had ever come across. I realised how many mutual friends we shared and it wasn’t long before we became friends. I spoke to our mutual friends to showcase her remarkable personality, and show the world how much of a positive effect she truly had on all of her friends, and anyone else she came into contact with. Louella was a character not to be forgotten, she was pretty much famous in and around north and east London. Friends have said they will always remember her brilliant sense of humour. She was an Islington girl through and through, and maintained that bubbly, cockney, and working class banter that everyone always loved. Two of her friends had told me that “Louella was a fun and bubbly person who always brought the most positive vibes”. They added: “Louella was generous, funny, kind and charming. We’re all at a loss”. Louella was also a Voga enthusiast and a great dancer, which was definitely where she gathered such strong positive energies, auras, and vibes. I would often watch her teach Voga at the Hoxton Gallery, which was described by her own team, The House Of Voga, as an “exercise regime to shape and empower, tone and strengthen through yoga and dance, music and expression”. Those who knew Louella would understand how this combination of spirituality, music, and dance was a perfect summary of everything which she stood for. I spoke to a dancer and friend of Louella’s, who said: “Every time I was in her presence she shared nothing but positive energy, and that is such a beautiful quality, as it can literally bring up a mood in a room. This area of London has been left in utter shock and sorrow as a result of her death, there is no doubt that will she will never be forgotten. A friend added: “She will be missed for many reasons. Her energy and her aura was very beautiful, you do not come across many a lot of people who own that quality”.